No Port Renfrew fishing news to report this week…. But here’s a link to some pretty entertaining fishing on Vancouver Island from years back. It’s not Port Renfrew, but it gets the blood pumping! Check out halfway through #2 into #3…71 pound spring salmon from what looks to be a 12′ boat! 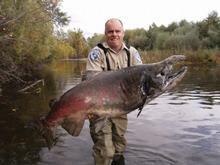 So here’s something else…an 85 pound chinook in the Sacramento River in California. They figure it weighed 90 pounds or more when alive. And they also figure it wouldn’t have spawned if not for the commercial salmon fishing closure down there. Glad to see this one got back, with thousands of little monster salmon babies coming back in 4-7 years. But in other fishing news, we had an interesting conversation with Maurice Tremblay from the San Juan Salmon Enhancement Society. These are the folks dedicated to preserving salmon stocks in the San Juan River through operating the Salmon Hatchery. The Hatchery is located one mile above Fairy Lake on Timberwest land. The fish live in net pens in Fairy Lake for a year before they are released to the sea. Maurice draws a comparison to cattle ranching: you rear them on the ranch, then open the gate and set them free, they return later when they are mature for harvesting. The San Juan Enhancement Society is a non-profit society, set up in 1978 as a CEDP initiative. The Society has four Directors that meet once annually, one full-time staff-member and one part-time. They seek volunteers to help on an as needed basis. Maurice reports the support of Forest Companies is crucial to their survival, with the Hatchery located on Timberwest land. The Port Renfrew Marina is a major supporter, generously providing $6000-7000 per year in revenues from fishing derbies in recent years. As a non-profit society, the San Juan Enhancement Society gratefully accepts donations, but keep in mind it is not a registered charity – so it cannot issue tax receipts. Maurice figures that you are fishing in the San Juan Harbour, then you might be catching hatchery Chinook. However, if you are out at Swiftsure Bank, the salmon you are catching could be from any one of 200-300 rivers on Vancouver Island, the Lower Mainland, Puget Sound, Columbia River, or anywhere in between. That’s why the fishing is so good out there, all the fish migrating past stop to feed on their way. It is interesting to note the Hatchery does not focus on coho any more. 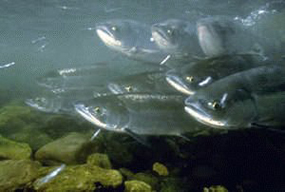 Maurice reports that years ago, the coho were so abundant that the Hatchery was ordered to stop producing them. 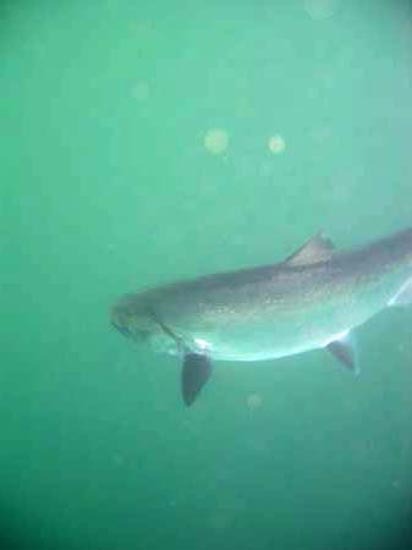 However, in recent years, the coho returns have dwindled again, but the Hatchery does not have the funds or people resources to produce coho – he says “we can’t even afford to buy the fish food for them”. Speaking from a fisherman’s perspective, we think this should be a major goal for the Hatchery, to help restore Port Renfrew’s greatness as a coho fishing destination. The San Juan Enhancement Society has been in business for 30 years and is a smooth-running operation, quietly and efficiently getting the job done, without fuss and without fanfare. We think they deserve kudos for their positive contribution to Port Renfrew’s great fishing…the efforts of the Tremblays and the other Society staff and volunteers help preserve the salmon stock for all of us, and for our children, and our children’s children. You are currently browsing the Port Renfrew Fishing Report blog archives for November, 2008.